The Nordstrom family still seems to be having trouble financing a bid for its namesake company, as evidenced by a lowball offer that was recently rejected by the retail icon's independent directors. For the past nine months, Nordstrom's (NYSE:JWN) founding family has engaged in an on-again, off-again attempt to take the storied retailer private. The family believes it would be easier to make the long-term investments needed to stay relevant in the changing retail landscape outside the spotlight of Wall Street. However, the Nordstrom family owns less than a third of the company's shares, and it isn't willing or able to pay a reasonable price for the rest. Earlier this week, a special committee made up of Nordstrom's independent directors rejected an offer from the family to pay $50 per share for the remainder of the company. Nordstrom's independent directors have rejected the founding family's $50-per-share offer. Image source: Nordstrom. The family hasn't given up on its go-private attempt yet. Nevertheless, given that it started with such a lowball offer, the likelihood of a successful transaction now seems extremely small. In many ways, the Nordstrom family's plan to take the company private makes sense. Most of the top leadership positions at Nordstrom are filled by members of the family. In those roles, they have invested heavily in e-commerce, off-price retail, and other new retail concepts in order to keep the company relevant in the face of growing competition. However, these initiatives have sapped Nordstrom's profitability. Furthermore, sales growth slowed beginning in the summer of 2015, leading many investors to question whether the company's growth initiatives would ultimately pay off. 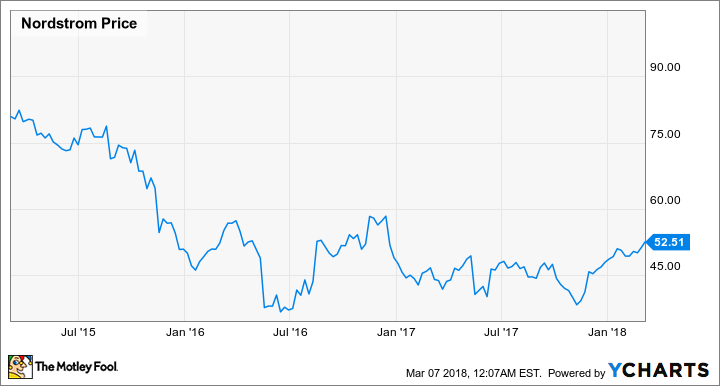 The net result is that Nordstrom stock, which peaked above $80 per share in early 2015, has traded in a range of $35 to $55 for most of the past two years. This is far less than what it would be worth if the company's growth plan ultimately works. By taking the company private, the Nordstrom family would capture most of the upside if their strategy succeeds, while letting impatient shareholders exit their investments. Nordstrom stock performance: data by YCharts. Unfortunately, the Nordstrom family couldn't convince Wall Street that its plan was a safe bet. Last fall, according to Bloomberg, lenders demanded interest rates of close to 13% to finance a leveraged buyout -- making it prohibitively expensive. The Nordstrom family and its private equity partner Leonard Green and Partners have offered to pay $50 for the shares they don't already own. The family noted that this price represented a 24% premium over the stock's closing price on the day before the company first announced the potential go-private transaction last June. However, Nordstrom stock has traded above the $50 mark for much of the past two months. That's not just because of buyout hopes: Shares of other department stores (including Macy's and Kohl's) have rallied even more since June, due to tax reform and improving sales trends. Nordstrom stock performance versus competitors: data by YCharts. In this context, it was a no-brainer for the special committee to reject the offer. Indeed, it's hard to imagine that the Nordstrom family seriously believed it would be possible to buy the company for as little as $50 per share, especially after tax reform delivered a huge windfall for retailers. A more likely explanation for the lowball offer is that the Nordstrom family is still struggling to get financing commitments. After all, to offer a higher price, they would need to pile even more debt onto the company. There's a decent chance that the Nordstrom family will increase its offer for the company at some point. However, the special committee that will evaluate any potential transaction has indicated that the $50-per-share offer isn't anywhere close to being adequate. While some pundits think a few extra dollars would seal the deal, that's not what the special committee seems to be indicating. Personally, as a Nordstrom shareholder, I would be reluctant to vote in favor of a buyout for a price less than $65 to $70. To offer that kind of premium, the family would have to raise about $2 billion of additional financing, which is extremely unlikely. The Nordstrom family's situation is ironic. They want to take the company private because investors aren't giving it much credit for its long-term growth investments -- but lenders wound up being equally nervous about Nordstrom's prospects. 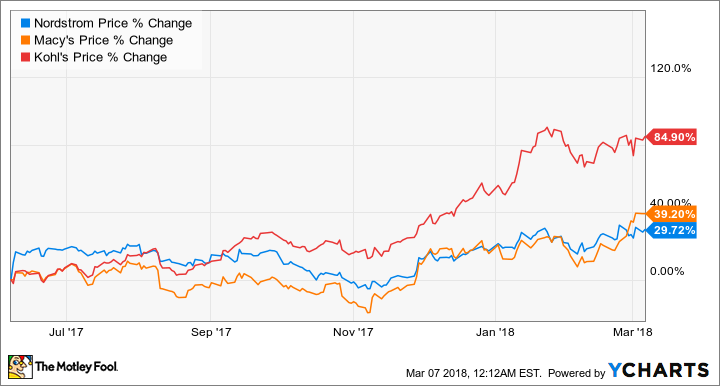 Patience, and the successful execution of Nordstrom's growth strategy, may be the only solutions to the stock's recent underperformance.